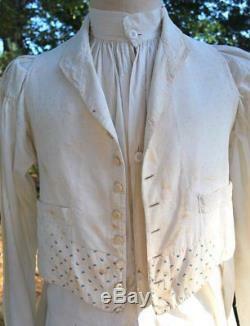 Country gents make do patched vest dating to the mid19thc. All cotton with homespun linen back, found in New England. Could be earlier then mid 19thc. As is with age staining. Chest measures 36" waist 34" length 17. Styled with early shirt that is also listed separately this week. KEEP IN MIND ANTIQUE AND VINTAGE ITEMS DO NOT HAVE SIZE/FABRIC CONTENT LABELS. CONDITION DESCRIPTION IN ALL LISTINGS. PLEASE ASK ALL QUESTIONS BEFORE BECAUSE ALL SALES ARE FINAL! The item "CIVIL WAR EAR COUNTRY GENTS EARLY WAIST COAT PATCHED" is in sale since Wednesday, October 17, 2018. This item is in the category "Clothing, Shoes & Accessories\Vintage\Men's Vintage Clothing\Other Men's Vintage Clothing". The seller is "heartnsoul1" and is located in Hollis, New Hampshire.